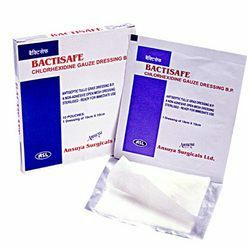 Bactisafe Chlorhexidine Gauze is an antimicrobial agent which acts against bacteria. Used as a primary wound treatment for burns, skin grafts, ulcers & other injuries. This dressing is coated with Chlorhexidine 0.5% w/w and is available in aluminum foil pouch.